Carin Pratt, left, wraps a gift for a customer as Liza Bernard pages through a book at the Norwich Bookstore on June 13, 2017, in Norwich, Vt. (Valley News - Jennifer Hauck) Copyright Valley News. May not be reprinted or used online without permission. Send requests to permission@vnews.com. Along with business partner Penny McConnel, Bernard opened the Norwich Bookstore in 1994 and has been a key player in the “Local First” movement in Vermont and the Upper Valley ever since. “When we first opened, people thought we were a little crazy,” Bernard said. The two met at a book study group in 1988. McConnel worked at the Dartmouth Bookstore, then one of the oldest independent bookstores in the country, and Bernard worked as an independent artist and consultant. As both approached work transitions in the early 1990s, Bernard — envious of McConnel’s work surrounded with books and people who love them — suggested the two open their own store together. The rest is history. 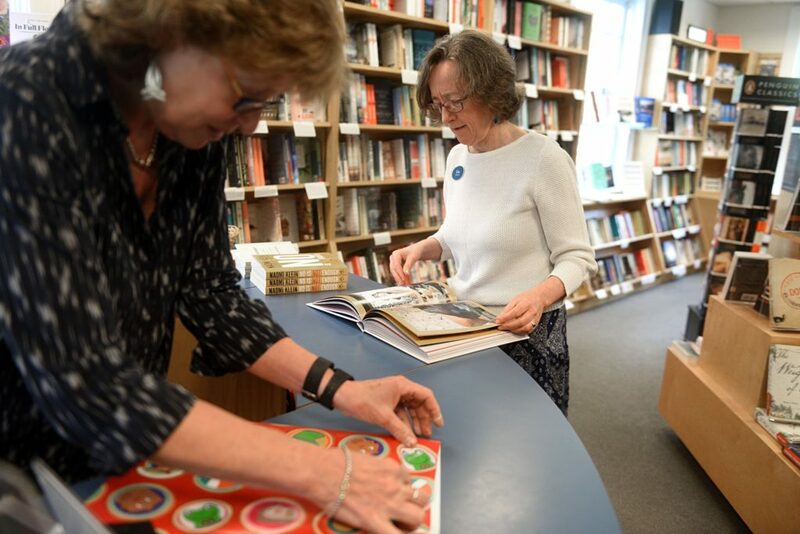 Now, more than two decades later, the Norwich Bookstore continues to offer books tailored to customer interests, along with many public events, often in collaboration with other local organizations like the library or historical society. A significant physical expansion two years ago has allowed the bookstore to grow its event offerings, including regular Thursday night book discussion groups and private events. 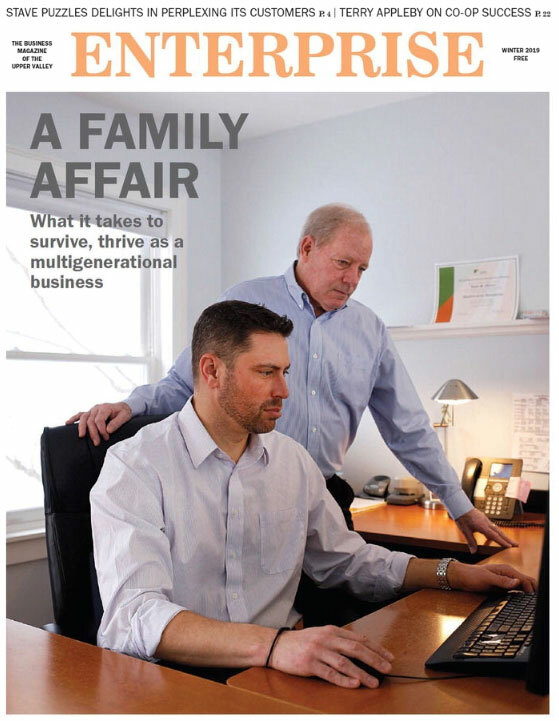 At the first conference they attended together 26 years ago, in anticipation of opening their store, Bernard and McConnel had one goal: to decide whether they needed a computer. Today, customers can check availability, order books or gift cards for in-store pickup or to be mailed, download e-books, stream audio, watch videos of past events taped by CATV, and check the calendar for what’s coming up, all right on the Norwich Bookstore’s website. In that department, you can hardly beat the Norwich Bookstore’s commitment to free book delivery to retirement communities for “avid readers who don’t drive. This epitomizes what we want to be — an integral part of the community,” she said. For that reason, Bernard was eager to help get the Upper Valley’s own Local First Alliance up and running. Initially a project of the Co-op Food Stores, Local First Alliance launched as a program of the nonprofit Vital Communities in 2009 and today has about 100 members strengthening and promoting the Upper Valley’s economy. The Norwich Bookstore is, of course, one of them. Consumers can find others online at VitalCommunities.org/LocalFirst. When Local First Alliance was founded nearly a decade ago, Bernard said, it was to share the message about the importance of “thinking local” when shopping, banking looking for service providers. According to the American Independent Business Alliance, the impact is dramatic: For each dollar spent at a local business, an average of 48 cents recirculates in the local economy, compared with only 14 cents per dollar of purchases made at chain stores. And that’s only the direct dollars and cents. The contributions of local businesses to their communities take many forms, from offering stable employment opportunities to making donations to local charities to simply providing physical spaces where residents can meet and interact with each other.